The blue on the right is actually a cement portion of the Lucy Brock School on the campus of ASU. The flowers are courtesy of some fine somebodies who cared enough to plant a tiny patch next to L.S. Dougherty for the summer folk and birds and butterflies to enjoy. To my co-workers: Bite me:) I like me some nature shots even if'n it is in the middle of Boone. Call me a pedestrian artist and I'll take that as a fine complement. Although I reckon the term should be more accurately coined 'scrolled through' or 'clicked by' artist. I love my new nickname, ya know, "Screen Saver Girl." Don't yellow flag anyone at work. I'm just having fun here and so was 'he who shall remain nameless'. Note the smiley face after the words, "Bite me." And off on another tangent. Does anyone else think that Kate from "John + Kate = 8" sound just like Ellen Degeneres? The morning air was laden with the scent of milkweed, but it was the common rhododendron in full bloom along my driveway which captured my attention. In this case the word 'common,' to which I refer the flower, is with praise because having lots of them is considered welcomed. In contrast, this evening as my husband and I enjoyed quiet conversation on our deck, my husband recounted a run-in with a particularly irksome lady. "She's plain common," he commented. To which I grimaced for I knew he did not flatter her nor did he want her to replicate en masse. The butterfly is fine but the milkweed ain't doing so good. It was Annie's fault. As I was shooting these blooms in a nearby pasture, she snuck up behind me and scared the butterfly away then yanked at the flower orb. She likes mouthfuls of flowers. She doesn't eat them, she just dethrones them and spits them out with no pity for the ruined beauty. I returned home this evening to find plants pulled out of pots, with little balls of dirt sprinkled on the front porch. Annie chews on my roses, she thinks my currants are candy, and wreaks havoc on daylillies. And to add insult to injury, when she isn't sneaking around sleeping on my deck cushions, she pulls them off and uses them as a chew toy. I am weary of my Annie's antics. I was mildly miffed yesterday evening after having to retrieve Annie from good-hearted, yet unthinking strangers who went on a hike on our property and picked up a curious Annie along the way. "We have your dog. She followed us while we were in your yard," was the word I received at work. I wanted to ask if they would please drive her back home so I wouldn't have to take off work early, but could tell they would feel that was an imposition. They were doing me a favor, after all, but contacting me. So I booked down to Walmart, bought a long chain, then rescued Annie from the clutches of do-gooders. Once home, I staked the chain in an obvious spot near the road, with access to both a waterhole and shade, in hopes that visiting folks from off the mountain will be less tempted to allow Annie to accompany them on their treks. I don't know. What do you think it should say? I took series of photos of the lavender blooming in front of Raley Hall on the campus of Appalachian State last week. For many of the shots I was on my side, often nose to bloom. Within minutes I felt a bit like Dorothy in Oz, sitting in the poppy field, relaxed with no worries. In fact, I was so care free, I forgot to blog for a couple of days. Just kidding. I've been out on a family mission. The details of which I will share later. It was a lightly foggy morning and as I descended my mountain top driveway this wild flaming azalea screamed out for attention. So I whipped out my camera and shot it! Finally, a beautiful day. I did not need a jacket although it was still quite breezy. I escaped the office and went around campus location scouting. The Rhodos are almost at their peak and when students begin returning next week, I intend to hijack several of them to work into my Rhodo/campas images. The motto around our office is: "Buildings without bodies look lonely." The alluring perfume of blooming lilacs beckoned me and the dog across the yard. 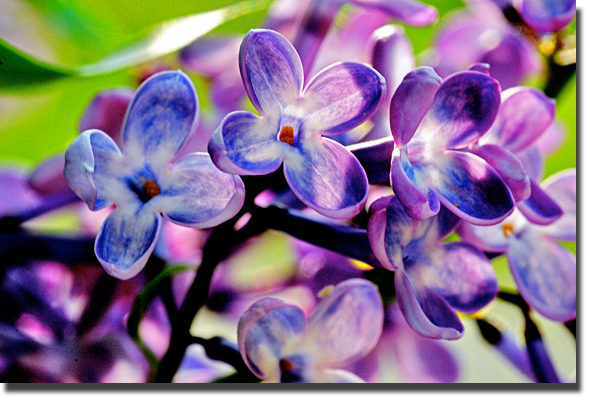 Lilacs are the flowers of olden times, when smells weren't so plentiful and complicated or mixed with new-fangled scents such as microwave buttery popcorn. Confession: The other day I kneeled on ground I had just dug and took in a huge musty whiff of earthy goodness. Of course, I did look to see if Puppy had visited the area prior. Fact: Puppy enjoys lilacs as well...to eat. Many of you have written to ask why Gnumoon placed a password on her blog. What I am able to tell you is that she spoke her mind on a post and was subsequently verbally threatened for doing so. Andt it got worse when she realized her site was being 'mined' for more information about Pookie and others in her family. Until she feels safe, she will not unlock her blog. However, if you email me ( [email protected] ) a request for her password, I promise to forward your request as well as any words of encourgement directly to her. 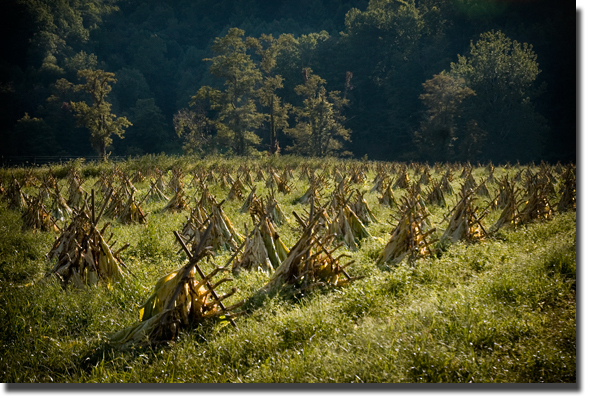 A late afternoon walk through Charles Church's fields in Valle Crucis was exactly what this gal needed. The Burley tobacco has been speared and wilts on wooden stakes for the next couple of days before it is tucked into the barn to air dry for a couple of months. I'm not exactly sure the name of this parasitic weed. It is kin to a Morning Glory but not nearly as well-behaved. I ventured outdoors yesterday evening and manage a couple of shots of asters and goldenrod currently in bloom. 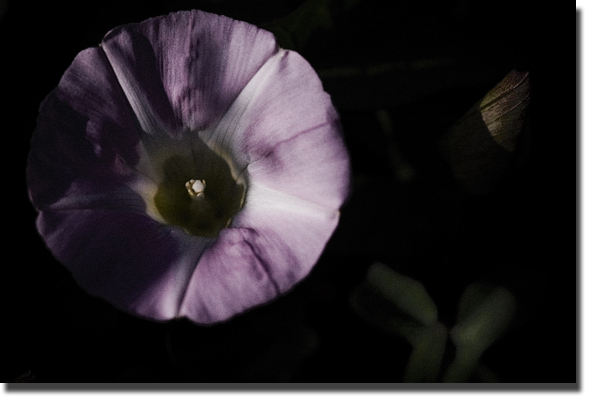 But I found this flower, partially sidelit yet still in the shadows. I spot-metered the highlights and based my exposure on that. Eh voila, here is what Marie could muster for the day. Oh, anybody got a spare satellite truck they wanna get rid of? And about my previous post....thanks y'all. Really. You rock my world. I'm doing much better.